JV Collier is one of the most sought after bass players of his generation. 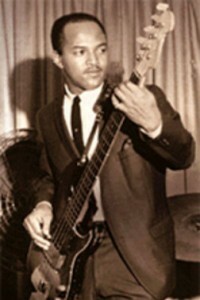 As a student of legendary Motown bassist James Jamerson, JV learned from the best. Now, after a career which has spanned more than thirty years, he continues to share his talents with some of the most recognizable artists in the music world. Born in Dixon, Tennessee, JV moved to the Motor City with his parents as a youngster. He first discovered his love for music at the young age of 10 when he began trombone lessons at his public elementary school. Two years later while listening to a Jimi Hendrix record, JV was inspired to try the bass. He decided to formally study the bass along with continuing his trombone lessons. By junior high school, JV had become accomplished enough on the bass that he began working the local club scene. He attended Mackenzie High School, where in band class, he struck up a friendship with James Jamerson, Jr., son of the famed bassist. James, Sr. frequently visited the class and gave lessons to the young bass players after school. In 1972, Motown Records moved to Los Angeles taking James Jamerson along and leaving a void in the city’s recording musicians pool. Sixteen year-old JV was offered the chance to record with some of the hottest R&B artists of the day – among them: The Temptations, Earl Klugh, Freda Payne, Ron Banks and the Dramatics, Enchantment, and the Floaters and producers such as Holland-Dozier-Holland, Paul Reiser and David Van der Pit. Soon after, a young trio of sisters called the Emotions offered JV the chance to go on tour. Next came calls from across the country, which exposed JV to not just funk and R&B but jazz, disco and pop. New York recording sessions led to work with artists such as Frankie Valli, the Brecker Brothers and Kellie Patterson, as well as producers like Bob Gaudio. Calls from Los Angeles led to work with artists such as Herbie Hancock, Ben E. King, Tyrone Davis, Dee Dee Bridgewater, and Alton McClain & Destiny. In the early 80s, JV met Don Was, then a struggling songwriter in the Detroit area. When Was formed an eclectic band which would later be known as Was Not Was, he called on JV to lay the foundation for his vision. JV recorded two albums with the band and toured Europe. In 1983, JV joined Gladys Knight & the Pips. During his ten year association, he toured the world and recorded with the legendary group. Additionally, he worked and recorded with The 5th Dimension, the Pointer Sisters, Marilyn McCoo and Billy Davis, Jr. and Norman Connors. In 1994, JV got a call from Grammy Award-winning singer/songwriter Bruce Hornsby. Hornsby invited JV to join the band, and eight years, several national tours and three albums later, their association continues. With the variation of Hornsby’s musical mix of blue grass, jazz, R&B, pop, and folk, JV has shared the stage with Bonnie Raitt, Chic Corea, Bela Fleck, George Duke, Kirk Whalum, the Band, Branford Marsalis, and has played bass duets with Victor Wooten and Christian McBride. “Making music that’s both challenging and interesting is food for my soul,” says the considerate, professional and devoted bassist. We enoughed meeting you last eve at the Great Room at Pelican Hill. We sent our son-in law, Brian Ogawa who lives near Vail and plays bass guitar with a variety of bands your contact info and encouraged him to connect. We hope to see you again tonight! Pin my tail and call me a dokyen, that really helped. It was a pleasure meeting you last night at the Tremont House in Galveston after your concert, and Mel and I appreciated your compliments on our trio. It meant a lot, especially after reading your very impressive bio! We hope to see you soon in person or on stage or screen! I don’t know how i ended up here whilst avoiding adulthood in my office, but I just wanted to share a story from a meaningful period in my life. Years ago I was a young man with a mexican jazz bass and tuition bills to pay. I had been picking up gigs here and there with local acts, always hoping to get that 50 bucks at the end of the night. At some point during all this I signed on with a more familiar name in the area and started touring regularly with him. One day he sat me down and said “We are going to listen to an album and you are going to hear exactly where we need to be.” It was Here Come the Noisemakers. I’ll be honest, it was years before I even learned your name…but I knew your tone and your pocket. I practiced soloing over changes while listening to “The Way It Is” and your tone became something I considered when moving through basses over the next 10 years. This story meanders and I’m sorry about that, but that is exactly how your influence came to find me. I didn’t know your name the way i knew Jaco, Victor, Stanley, or James…but I had memorized your grooves with equal enthusiasm. So for what it is worth, thanks. That record changed the way I played…and the way I played defined so much of my life. I must say it was hard to find your site in google. You write awesome content but you should rank your page higher in search engines. Your Kindness Put a Smile in My Heart! Only old friends would know that a young Jervonny Collier was a terrifically talented softball player and one of the fastest humans to ever run the bases on a diamond. I guess you could say that he has been equally amazing on the bases as he has been on the basses.